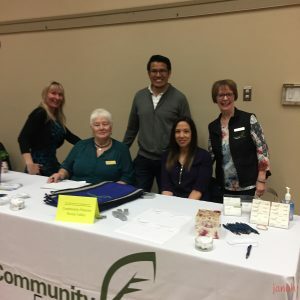 Merritt BC Non-Profits – Success at Our Engagement Fair! 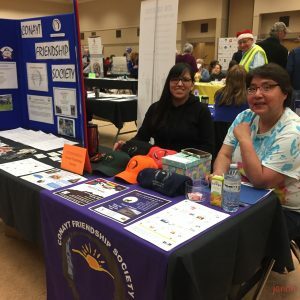 Community Futures Engagement Fair 2019, a real success! Merritt BC Non-Profits are like non-profits everywhere…contributing to the vitality of their community! These essential groups provide the good works and the enjoyment that cities, towns, and villages need and want. As my partner always said in his coffee paper, the Merritt Morning Mirror, “Have some fun, do some good!”. 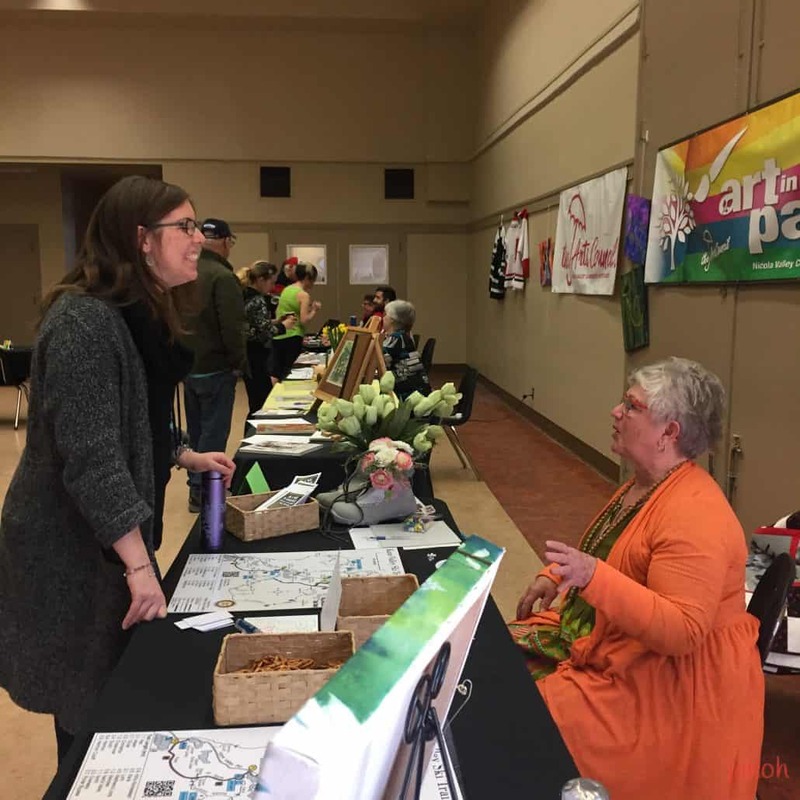 Last weekend, Community Futures Nicola Valley put on a great event showcasing the Merritt BC Non-Profits. 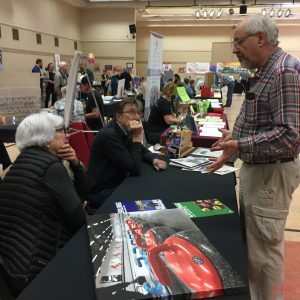 The Nicola Valley has a lot of non-profit groups and the Civic Center was full of tables, volunteers, posters, pamphlets and sign up sheets…. Non Profits depend on volunteers…. Non-Profits depend on volunteers, the heart-blood of any organization. And that March Saturday was a congregation of well-doing individuals, committed to providing good works, and fun to young and old. 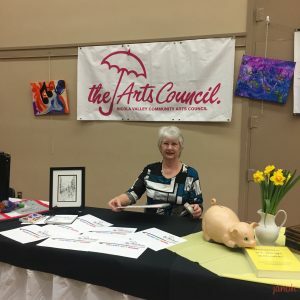 General organizations and specific, from the Chamber of Commerce, to the Curling Club, to the Old Time Fiddlers, were represented at this successful event by dedicated volunteers. What Merritt BC Non-Profit group do you belong to? Almost everyone I know belongs to one, or more, of the Merritt BC Non-Profits. So the Civic Center was full of friends and colleagues, all dispensing info and enticing passers-by to be a part of their organization. I did my part at the Nicola Valley Community Arts Council tables, helping with set up. And I did my best to stay put at the table and tell people what we are up to and wave membership forms at potential participants. And as I wandered myself, I gathered info and stories from the reps at the tables. There were groups there I had heard of, but hadn’t chatted with. And groups I have participated with since I moved to town with my just-starting family in 1979! So I found that I know a lot of these groups, and the volunteers who run them and their events. I attend Community Futures events. I am a Patreon for the Love to Dance Academy and their organization the Merritt Dance Society. The Old Time Fiddlers’ get-togethers at the Seniors Center get my support with announcements and posters. 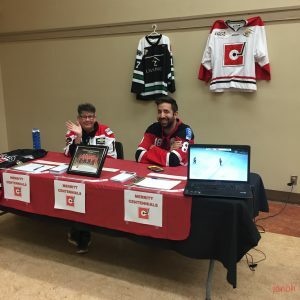 I encourage friends to spectate and cheer for the Centennials Hockey Team. 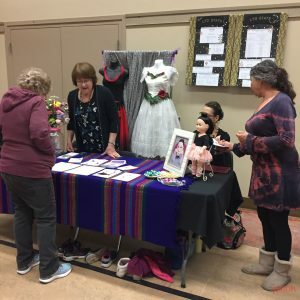 I participate in Chamber of Commerce Friday Night Markets, send interested beginning entrepreneurs to CFNV, give kudos and items to the local Nicola Health Care Auxiliary. 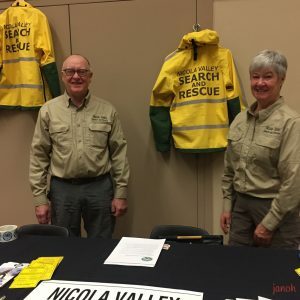 Groups like the Search and Rescue, Scw’exmx Family Services, Nicola Valley Food bank, and the Citizens Patrol do so much good in the community! I bought my membership for the Canadian Country Music Heritage Society there, one of my favorite non-profits in the community. I have loved volunteering at and supporting the Country Music Hall of Fame over the years. While I was wandering, taking photos for my personal no-profit endeavor, Creative Community, I was impressed with the time and energy all the groups took with their displays. 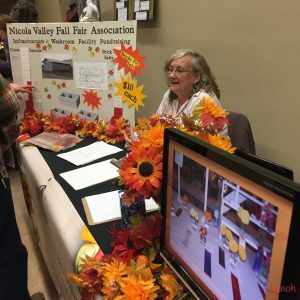 Several groups even had technology set up…TV’s displaying videos and slide presentations, like the beautiful, so-local, and very-worthwhile Nicola Valley Fall Fair Association. Let’s stop for a moment here and let you know, if you don’t already – the Nicola Valley Fall Fair Association is fundraising for an Infrastructure and Washroom Facility. This is a much-needed essential for this organization, and for the whole town! I would like to encourage all of us to get behind this fundraiser, and look after the basic needs of all the visitors, local and not, attending one of the oldest and most beloved events in our community, and in so many rural communities. A while back I attended a Chamber of Commerce Grant Writing Workshop, and really enjoyed being in the room with other groups detailing their needs in a grant writing session. From requests for bathroom facilities to setting up programs for kids with special needs, to support for young musicians and artists I was impressed with the dedication of these volunteers to our community well-being. That workshop and this Community Futures Community Engagement Fair offered insight into the complex and worthwhile projects our community is willing to dedicate their time to and are willing to work on. But let me say that groups in our community that are working to provide basic necessities like a place to pee, is needed as much as, OR MORE THAN (or at least BEFORE) the enhanced events and activities we are all working on. We can’t invite people to our events without providing the basics. So, if you hear of a group asking for bathroom facilities, perk up your ears and reach for your wallet. Merritt BC Non-Profits Opportunity to Network! It was a lively, colorful, noisy-with-talk event, and afterward the feedback about it was…great! A GREAT opportunity, not just to inform and invite the general public to participate in the non-profits, but to network and exchange possibilities with like-minded groups populating the room at the Civic Center. After cruising the room, taking photos, enjoying the chats, listening to the music by the Community Choir, the Old Time Fiddlers, the Strings Plus, and watching the dancers from Love to Dance, I settled in at the Nicola Valley Community Arts Council table, the non-profit where I spend most of my volunteer hours. NVCAC’s Nicola Valley Talent Network project…more info coming! By the way, at the Nicola Valley Community Arts Council’s home, at the old Courthouse, 1840 Nicola Avenue we have basic facilities. Come and visit us there! We are busy reaching out to the community for interaction, memberships from individuals, groups, and businesses at the Courthouse, and also at events like the Community Futures Community Engagement Fair. Want to know more about the local Arts Council? Visit our website! Visit my Creative Community facebook page. Have a creative, satisfying day! Let’s get out there and…. Have Some Fun, Do Some Good! https://experiencenicolavalley.com/wp-content/uploads/2019/04/0008-Watermarked632019-03-24-2226.jpg 2448 2448 Jano https://experiencenicolavalley.com/wp-content/uploads/2018/05/merrit-nicola-logo-01-300x254.png Jano2019-04-02 13:57:062019-04-02 13:57:06Merritt BC Non-Profits - Success at Our Engagement Fair!